As we've already learned, electricity requires a complete path (circuit) to continuously flow. This is why the shock received from static electricity is only a momentary jolt: the flow of electrons is necessarily brief when static charges are equalized between two objects. Shocks of self-limited duration like this are rarely hazardous. Without two contact points on the body for current to enter and exit, respectively, there is no hazard of shock. This is why birds can safely rest on high-voltage power lines without getting shocked: they make contact with the circuit at only one point. In order for electrons to flow through a conductor, there must be a voltage present to motivate them. Voltage, as you should recall, is always relative between two points. 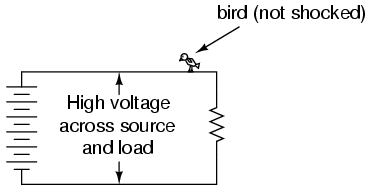 There is no such thing as voltage "on" or "at" a single point in the circuit, and so the bird contacting a single point in the above circuit has no voltage applied across its body to establish a current through it. Yes, even though they rest on two feet, both feet are touching the same wire, making them electrically common. 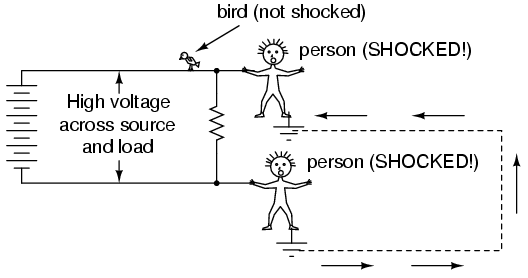 Electrically speaking, both of the bird's feet touch the same point, hence there is no voltage between them to motivate current through the bird's body. The ground symbol is that set of three horizontal bars of decreasing width located at the lower-left of the circuit shown, and also at the foot of the person being shocked. In real life the power system ground consists of some kind of metallic conductor buried deep in the ground for making maximum contact with the earth. That conductor is electrically connected to an appropriate connection point on the circuit with thick wire. The victim's ground connection is through their feet, which are touching the earth. If the presence of a ground point in the circuit provides an easy point of contact for someone to get shocked, why have it in the circuit at all? Wouldn't a ground-less circuit be safer? The person getting shocked probably isn't bare-footed. If rubber and fabric are insulating materials, then why aren't their shoes protecting them by preventing a circuit from forming? How good of a conductor can dirt be? If you can get shocked by current through the earth, why not use the earth as a conductor in our power circuits? Because the bottom side of the circuit is firmly connected to ground through the grounding point on the lower-left of the circuit, the lower conductor of the circuit is made electrically common with earth ground. Since there can be no voltage between electrically common points, there will be no voltage applied across the person contacting the lower wire, and they will not receive a shock. For the same reason, the wire connecting the circuit to the grounding rod/plates is usually left bare (no insulation), so that any metal object it brushes up against will similarly be electrically common with the earth. 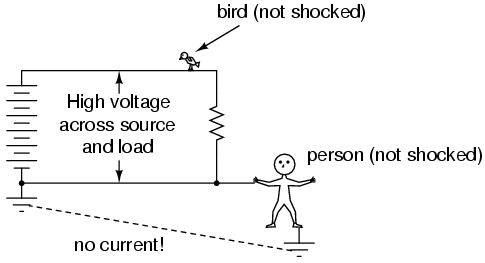 With each person standing on the ground, contacting different points in the circuit, a path for shock current is made through one person, through the earth, and through the other person. Even though each person thinks they're safe in only touching a single point in the circuit, their combined actions create a deadly scenario. 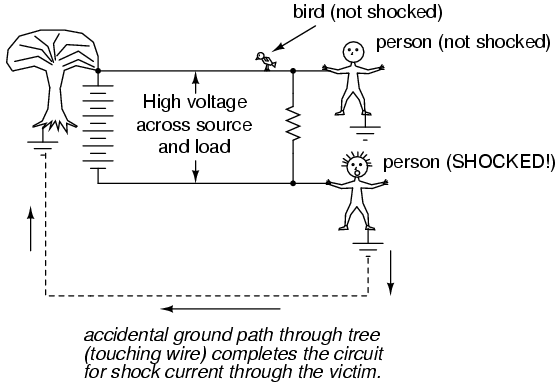 In effect, one person acts as the ground fault which makes it unsafe for the other person. This is exactly why ungrounded power systems are dangerous: the voltage between any point in the circuit and ground (earth) is unpredictable, because a ground fault could appear at any point in the circuit at any time. The only character guaranteed to be safe in these scenarios is the bird, who has no connection to earth ground at all! By firmly connecting a designated point in the circuit to earth ground ("grounding" the circuit), at least safety can be assured at that one point. This is more assurance of safety than having no ground connection at all. In answer to the second question, rubber-soled shoes do indeed provide some electrical insulation to help protect someone from conducting shock current through their feet. However, most common shoe designs are not intended to be electrically "safe," their soles being too thin and not of the right substance. Also, any moisture, dirt, or conductive salts from body sweat on the surface of or permeated through the soles of shoes will compromise what little insulating value the shoe had to begin with. There are shoes specifically made for dangerous electrical work, as well as thick rubber mats made to stand on while working on live circuits, but these special pieces of gear must be in absolutely clean, dry condition in order to be effective. Suffice it to say, normal footwear is not enough to guarantee protection against electric shock from a power system. Hand or foot contact, insulated with rubber: 20 MΩ typical. As you can see, not only is rubber a far better insulating material than leather, but the presence of water in a porous substance such as leather greatly reduces electrical resistance. In answer to the third question, dirt is not a very good conductor (at least not when its dry!). It is too poor of a conductor to support continuous current for powering a load. However, as we will see in the next section, it takes very little current to injure or kill a human being, so even the poor conductivity of dirt is enough to provide a path for deadly current when there is sufficient voltage available, as there usually is in power systems. Some ground surfaces are better insulators than others. Asphalt, for instance, being oil-based, has a much greater resistance than most forms of dirt or rock. Concrete, on the other hand, tends to have fairly low resistance due to its intrinsic water and electrolyte (conductive chemical) content. 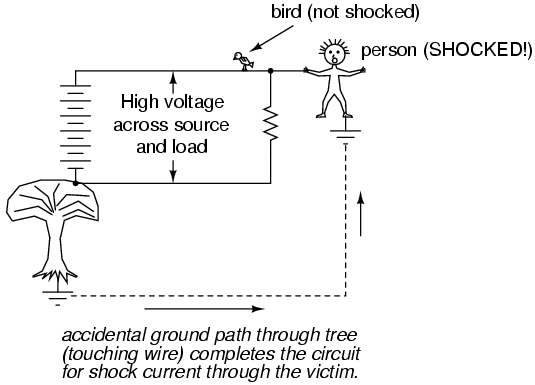 Electric shock can only occur when contact is made between two points of a circuit; when voltage is applied across a victim's body. Power circuits usually have a designated point that is "grounded:" firmly connected to metal rods or plates buried in the dirt to ensure that one side of the circuit is always at ground potential (zero voltage between that point and earth ground). A ground fault is an accidental connection between a circuit conductor and the earth (ground). Special, insulated shoes and mats are made to protect persons from shock via ground conduction, but even these pieces of gear must be in clean, dry condition to be effective. Normal footwear is not good enough to provide protection from shock by insulating its wearer from the earth. 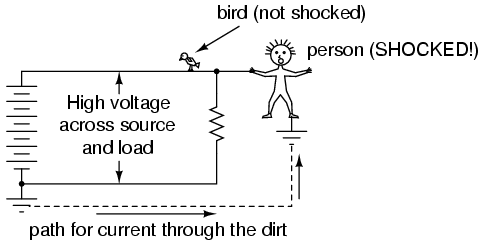 Though dirt is a poor conductor, it can conduct enough current to injure or kill a human being.